Based on reviews from 693 users. Learn how our rankings work or see our guide to Asics Gel sneakers. Updated Apr 2019. The ASICSTIGER is a lifestyle brand which is the fusion of modern flair and Japanese heritage. Resonating Japan’s spirit in each new collection, the Asics Gel sneakers have been released in different silhouettes from the updated classics to new styles as well as collaborations with cultural connoisseurs and brilliant artists. In 1986, Asics introduced and started applying Alpha Gel technology to all its high-performance sports models, providing a quality air cushioning system. From there, it became an instant classic. With a tangible and visible design, the GEL technology continues to hold Asics philosophy and opens unlimited possibilities for the future sneakers. Thirty years after its birth, the brand has been releasing different models of Asics Gel sneakers for men and women to enjoy the comfort and functionality in every stride. It is available in a low- or mid-top silhouette sneaker which heritage may have been taken from running, training or basketball. As per the biochemist at the University of Massachusetts Amherst Joseph Hamill, shoes are essential in any sport. It is designed to stop or alleviate specific factors regarding reducing injury risk. One of the recent studies even suggests that wearing a low-cut shoe is appropriate for athletes, especially basketball players, who are susceptible to Achilles tendinopathy. Asics Gel sneakers with low-top silhouette offer adequate ankle mobility but with less protection compared with mid-top Asics Gel sneakers. Asics Aaron - Flashing the iconic Asics stripes, this sneaker has a minimalistic style yet oozes with a flair of sporty and retro vibe. Designed with a lace-up closure on a leather upper, it has a striped vulcanized outsole with a circular tread pattern that offers a reliable grip while its cushioned footbed, padded tongue and opening, and mesh lining delivers supreme comfort. Asics Aaron CV – Designed with a canvas upper, it provides breathability and comfort perfect for summer. For added durability, this sneaker has double stitching detailing on the toe cap and at the heel area. Asics Gel-PTG – Inspired by the iconic basketball shoes of the ‘80s, this sneaker is recognized as among Japan’s known popular basketball shoes ever designed. With a perforated vamp, the PTG's suede upper offers all-day breathability. As the rubber outsole itself delivers reliable grip, the pivot points on the outsole at the same ensure quick movements. Not to forget the classic Asics stripes which give a stylish edge, perfect for your weekend looks. Asics Gel Lyte III –Designed by Shingeyuki Mitsui, the Asics Gel Lyte III was initially released in 1990. Since then, it was released in different combinations and materials. With synthetic suede and nylon uppers, this shoe has dual-density EVA midsole, 3M reflective detailing, breathable mesh lining and the Asics branding stripes. It is available in different variations and collaboration including Asics Gel Lyte III Camo, Asics Gel Lyte III “Easter” Pack and Asics Gel Lyte “Reptile” Pack. Asics Gel Kayano Trainer Knit – Initially released in 1993, the Asics Gel Kayano was purposely designed for long-distance running. The design was inspired by the exoskeleton strength of the beetle. It has a Coolmax-lined upper and a horn-like sole while the P-Gel and theta Gel cushioning installed in the forefoot and rearfoot respectively. On February 24, 2017, a revamped Asics Gel Kayano with a one-piece full knit upper in a monotone look was released to the public. With the knit construction, it gives a lightweight feel and look as well as a sock-like fit on the ankle. This variation is designed for the modern and dynamic urban life as well as the people that live it. Other iterations have been made using this silhouette such as Asics Gel Kayano Trainer Space Dye Knit. Asics Gel Diablo – Initially released in 1995, the Asics Diablo has a combination of leather and breathable mesh upper with perforation details. With a daddy style trend, it was reissued by Superior Birch in the fall of 2017. It has an updated look, featuring a speckled Gel midsole and a premium white leather. It comes in black and white and monochromatic tan colorways. Asics Gel Lique – Rocking the ‘90s style, the Gel Lique masters a mix of mesh and suede upper in streamlined color combinations. It has an asymmetrical toe detail and color-blocked midsole, capturing a retro vibe with a modern touch. It is up for grabs in colorways including Peacoat/Latte, Dark Forest/Birch, Burgundy/Birch and Provincial Blue/Stone Gray. Asics Gel Lyte V RB – Released in 2018, this special edition takes the style of the iconic silhouette of the Gel Lyte V and reborn it to a modernized look. Still equipped with the Gel technology for cushioning, the Asics Gel Lyte V RB has a thinner monosock as well as eyelet stay to provide a comfortable ride. Its sock-like fit stretches with each stride as well as allows your feet to glide on and off with ease. Some of the colorways include Dark Forest/Mid Gray, Rose Taupe/Pale Mauve, Birch/Blue Surf and Black/Rose Taupe. Asics Gel Respector – Launched back in 1991, this sneaker had a cool and old-school Respector but built to last which aficionados respect and recognize. It has the iconic ‘90s shape and a sleek upper, providing sufficient support. Depending on the colorway, the upper is crafted with a mixture of nylon, synthetic leather, and suede materials. It has the EVA midsole the provides all-day comfort while its large heel protector keeps you confident and stable. Colorway includes Glacier Gray and Taos Taupe. Asics Gel Lyte V NS – A must-have for sneaker enthusiasts, this sneaker’s original silhouette was initially launched in 1993. Re-released in 2017, the Asics Gel Lyte V NS has a lightweight design, intended for casual wear as well as long walks. With enough ventilation, the mesh and synthetic materials are fused into the upper which keeps the feet fresh and cool. You can choose from different colorways including Safety Yellow, Flash Coral, Aquarium, White, and Black. Asics Gel Lyte V Reflective – Originally released in 1993, this edition is among the Asics Gel sneakers that has an advanced and modernized no-sew construction. It is an icon evolution, a must-have for sneaker enthusiasts. With an understated impact, this sneaker has low-light reflective detail, giving a distinctive characteristic. For an adjustable and comfortable fit, a lace-up system sits atop of the inner bootie construction that comfortably hugs the boot with its adequate padding. Asics Gel Sight – The Sight was initially released in 1992 for the Japanese Olympic Team. Equipped with the Gel technology wave suspension, this sneaker claims its original heel stabilizer. It has a smooth suede upper with perforated vamp and suede tongue logo. With its gel material visible through outsole window, it delivers a supremely comfortable ride. The mid-top Asics Gel sneakers are slightly lower than the high-top shoes which people got confused more often than not. Asics Gel sneakers with mid-top silhouette provide some extra ankle support and protection than the low-top footwear, at the same time not as restrictive as the high-top shoes. Asics Gel Lyte MT – Originally released in released in 1987, the Gel MT made its comeback in 2017. Equipped with the Gel technology, it reduces injury and allows perfect density when running harder or landing softer. With an exclusive shaped heel protector, it enables lateral movement support while the toe box has windows that provide a step in the right direction. It is available in a myriad of colorways including Rose Taupe, Marzipan, White/Mid Gray, Black/White, Aluminum/Glacier Gray and Carbon/Taupe Gray. Asics Gel PTG MT – Also known as the Gel Point Getter, the Asics Gel PTG MT sneaker has a mid-top silhouette which is based on the iconic basketball shoe from the 1980s that is still sold today in Japan. The classic branding stripes and its stylish edge make it perfect for your weekend looks. It has an outsole with pivot points, allowing quick movements. Depending on the colorway, it has a leather or suede upper with a perforated vamp that provides breathability as well as the comfortable ride for all-day wear. It is available in colorways including All-Meerkat, White/Black, White/Red and All-Tan. 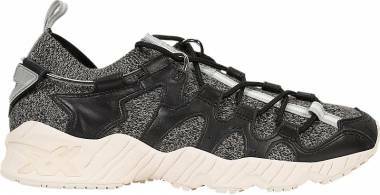 Asics Gel Mai Knit MT – The sleeker Gel Mai Knit MT silhouette compared with the original profile which was initially launched in the ‘90s. With a striking aesthetic appeal, the knit overlay design is smoothly constructed. With a unique asymmetrical eyelet stay, it provides an adjustable and comfortable fit as well as stability to both the ankle and forefoot. Ultimately the Gel cushioning ensures all-day comfort when you hit the street. You can choose from different colorways including Black, Caramel, and Forrest. Asics Gel Kayano Trainer Knit MT – With the mid-top version of the Asics Gel Kayano Trainer Knit, this shoe has a sock-like fit up to the ankle, providing an added support and comfort. It exudes a sophisticated look that catches the eye. Instead of branding overlays, it has a TPU cage that offers reliable support and better lockdown. It is available in Peacoat, Black, and white colorways. Asics Gel Lyte Komachi Strap – Specifically designed for women, it is among the Asics Gel shoes which style takes the cue from the iconic heritage model with modern updates. This mid-cut sneaker has a slimmer silhouette with a lightweight feel and a feminine look. With a mesh knit upper that provides breathability, it also has an elastic instep strap for easy slip-on. Equipped with the Gel technology for cushioning, it utilizes a silicone-material that effectively delivers efficient shock absorption and provides strong impact resistance. Its rubber outsoles give a sure-footed grip. The available colorways include Stone Gray and Black. Asics has partnered with clothing brands, rappers, and boutiques, reworking some shoes from the ‘90s and bringing a new audience to the company. This version is the first team-up for the Asics Gel Lyte V as well as the second most-used silhouette for Asics collaboration. Ronnie Fieg transformed the Gel Lyte V silhouette by incorporating the shades of orange and red. He took the inspiration from Kith's past and present state, hoping an eruption to its future state. The upper is a mixture of mesh and nubuck upper in the mix of burgundy and red. Accenting on the stretched tongue is a pink neoprene, adding flair to the design as well as the Asics branding and the single-stitched orange panel on the heel. Finishing off the design, it has a navy outsole and off-white midsole. Sneakersnstuff x Asics GT-II "Seventh Seal"
Inspired from the Swedish movie “The Seventh Seal,” this sneaker is a low-top running-inspired shoe that utilizes the GEL technology in the midsole. This footwear with black upper has a chess piece on the heel which makes the shoe stand out against the black backdrop. In collaboration with the Sneakerstuff, this shoe edition was released in 2012. Released after six months from its original date in 2013, this sneaker has light blue suede and a tan midsole which was inspired from the shop’s location near Lake Michigan in Chicago. It is made from premium materials. Sparked from the Mobile Suit Gundam Anime series, the Asics Gel-Saga silhouette was made available in an exclusive colorway as Asics and Footpatrol joined forces. The Footpatrol x Asics Gel-Saga has been made available on July 28, 2018, at Footpatrol’s store in Paris and London and the wider online release is set for August 11 this year. With mech-inspired color scheme, this sneaker sports a cream suede and white mesh upper accented by the branding stripes in the shade of metallic blue. A touch of neon pink radiates on the insole branding. The shoe has the blue Asics insignia is at the side and clean tonal laces as well as a dark gray outsole that complements the understated colorway. Visible on the tongue, midsole and towards the rear is the complementary-colored branding. As Monkey Time partnered with Asics, another impressive edition of Asics Gel sneakers was released on the market. The desert-inspired sneaker is simple yet incredibly enchanting to the eye. With a sandy tonal tan upper, it is built with premium suede accented by a touch of black. Adding a good impression, it has a hairy suede on the heel. This silhouette was also first available in a colorway called Monkey Time x Asics Gel Lyte V “Lights and Shadows.” With premium leather upper, this sneaker has high contrasting black and white colorway. It has a speckled midsole that finished the shoe’s look. With a limited of 60 pairs released worldwide, this kick is designed in partnership with Barcelona’s 24 Kilates. With an excellent design execution, this limited edition is packed with a bottle of the best selling Tio Pepe, a Sherry brand. With Tio Pepe’s finishing touches, this sneaker has an impressive level of details. This shoe features a hunter green upper with a black mesh layer. A red shade accented on the tongue label and heel, giving a contrasting look. The “24 Kilates” embroidered onto the end of shoelaces. In recognition of the Beauty and the Beast movie, Disney and Asics collaborated to create a special edition pack out of one of the iconic Asics Gel sneakers. Utilizing the Gel Lyte III silhouette, this sneaker features a Beauty and the Beast edition. It is available in three colorways, two of which represents “Beauty” while the other one is for the “Beast.” All pairs are done in blocking and colors, representing the customs shown on the film. The two colorways representing “Beauty” has a leather upper decorated with a rose embroidered pattern. The word “BEAUTY” is imprinted on the icy outsole and a red rose stitched at the heel, paying homage to the movie. On the other hand, the shoe with Coffee Bean/Medieval Blue colorway has the word “BEAST” imprinted on its icy outsole. For a snug fit, the signature split tongue is installed. Moreover, the Disney branding complements the look. Released on April 30, 2016, this edition is among the Asics Gel sneakers that bring back the colorway by the German sneaker shop that initially spotted in 2012. Utilizing the Asics Gel Lyte III silhouette, Solebox and Asics partnered to bring the excellent look back in the form of the Blue Carpenter Bee colorway. Inspired from the blue species of the indigenous bee of Southeast Asia, this futuristic sneaker features a metallic black nubuck upper blended with a bright-blue microsuede. The Solebox branding glows at the reflective heel while a grid-like aesthetic is on the lateral side, detailing the carpenter bee’s wings. Asics, in partnership with Yoshida & Company, issued another iteration of the Asics Gel Kayano silhouette. Named after its designer Toshikazu Kayano, the original silhouette was released in 1993. Since then, it was released to different models up to the 25th version or the Asics Gel Kayano 25. In this collaborative endeavor, the Porter x Asics Gel Kayano Trainer was launched worldwide on March 11, 2017. It has a monosock structure, integrating the ankle opening and textile tongue. Soaked in black, the upper is a combination of suede and nylon fabric while the inner lining is sparingly accented with an orange hue. Branding on the tongue and near the collar is accentuated in the shade of orange too. Tokyo-based sneaker purveyor Kicks Lab joined forces with Asics for another collaborative endeavor using the Gel Lyte III silhouette. Released on March 31, 2018, it is available at Sneakerstuff and other select Asics retailers. Aptly named as “KL-Shinobi” fit for a ninja, this sneaker has a clean and perfect blend of white, gray and black shades on a premium leather upper and suede paneling, giving a monotone look. It has an icy outsole with a cool imprint of Japanese characters as a tribute to the silent mercenaries. When buying Asics Gel shoes, like other shoes, people consider how much a pair of shoes is worth. They check if it fits their budget or if the shoe’s specification is worth the price. Depending on the design, colorway, and material used, price ranges for Asics Gel sneakers vary from as low as $70 up to $300 and above. Check out some of them. Generally, Asics Gel sneakers are a unisex shoe. Men’s sizing ranges from 4 to 14 US. Women who want to pick from men’s sizing, they need to subtract 1.5 sizes from their usual size to achieve the right and comfy fit. Asics Gel sneakers for kids are available in sizes K4, K5, K6, K7, K8, K9, K10, K11, K12, K13, 1, 2 and 3. Choosing the right pair of Asics Gel sneakers is essential to enjoy an uncompromising comfort while remaining stylish. You need to consider the sizing as well as pronation to get the right support and level of comfort you need. Pronation is the human body’s natural movement which refers to how your foot rolls inward for impact distribution upon landing. People with high arches are called underpronators or supinators. Because of high arches, when their foot hits the ground, it doesn’t roll inward or rolls inward just a little (pronates) which causes shock transmission through the lower leg. An excellent amount of cushioning is needed by underpronators to avoid strong impact. Underpronators may encounter shin splints, plantar fasciitis, and ankle strain. Neutral pronators have normal-sized arches. They have even distribution the foot front. When their outer side of the heel hits the ground, it pronates (roll inward), providing body weight support and shock absorption. For users with neutral pronation, they have the liberty to wear a wide variety of footwear. They need not worry about cushioning or support. Neutral pronators are less likely to encounter injuries because of efficient shock absorption. Overpronators are people with flat feet or low arches. Their big toes perform the majority of work. When their outside heel hits the ground, it rolls inward excessively, transferring the body weight to inner edge rather than the foot's ball. On the contrary, for those overpronators, they need to find shoes that offer structured cushioning and reliable support. Overpronators may experience plantar fasciitis, heel spurs, bunions and shin splints. Among the Asics Gel sneakers, the Corsair has the exciting story in the history. Back in 1969, Onitsuka Tiger, known today as Asics, released the Cortez in the market. Phil Knight, currently the chairman and co-founder of Nike Inc., was a sales rep for Tiger back in the 1960s and felt that he was instrumental in Cortez’s development. Therefore, he took the design with him when he left Tiger to form his own company. This event caused a lengthy court battle. Finally, in 1974, the court decided that both companies had the rights to the shoe’s design. However, Tiger was not allowed to use the name Cortez. Thus the company named it as Corsair instead. Present on almost all the Asics Gel sneakers’ silhouette, the Asics Stripe marked its half-century existence in 2015. The idea behind the Asics Stripe is merely to provide firmness around the foot. 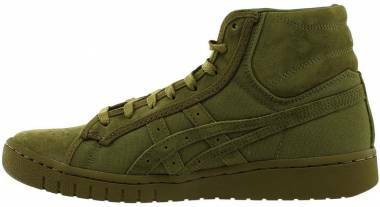 In 1964, Blue Ribbon Sports was an official distributor of Onitsuka Tiger shoes, currently identified as Asics Gel sneakers, in the US. Blue Ribbon Sports is now known as the company Nike Inc. Wearing a pair of Asics Gel shoes, Katie Holmes matched the shoe with black leggings with a casual top. After attending a grueling fitness session, Jennifer Lopez was seen walking in NY. She wore fitted leggings and a sweaty shirt that looked awesome with her Asics sneaker. Walking out of the parking lot, Reese wears a pair of Asics Gel sneakers with shorts and a plain gray shirt. She was also seen jogging with another pair of bright-colored Asics Gel sneakers that worked well with her jogging pants and topped with a fitted shirt. Wearing a pair of Asics Gel sneakers in a White/Navy/Icy Blue colorway, Kate flaunted her sporty getup with a pair of cycling shorts and topped it with a red fitted shirt and a nylon jacket. To finish off the sporty vibe, she wore a red cap. Jessica was seen wearing a bright pair of Asics Gel sneaker with her Lululemon shorts and a long-sleeved zippered top. To complete the sporty vibe with an added class, she wore her pair of Gucci sunglasses and a black handbag. Using a capital of ¥300,000 and hiring four employees, Kihachiro Onitsuka founded the Onitsuka Co., Ltd. in 1949. When Onitsuka Kohei Hori heard about the business, Hori gave Onitsuka the maxim of Juvenal which was "Anima Sana in Corpore Sano." "Anima Sana in Corpore Sano" (A.S.I.C.S) means "If you pray to God, you pray for a sound mind in a sound body." This statement made so much impact to Onitsuka that later on its acronym became the brand's name. Today, this Japanese multinational company produces not only sports equipment but also footwear for a wide range of sports. In 1949, Onitsuka started manufacturing basketball shoes in Kobe, Japan. He made several prototypes and released the first model in the spring of 1950. In 1951, the company released the suction-cup basketball shoes. Like the octopus’ suckers, it had deep dimples on the whole of soles to improve the starting and braking performance. The company also manufactured and launched the first tennis shoes in the following year. In 1953, Onitsuka Tiger released the Marathon Tabi which had a highly advanced upper for an improved fit and rubber soles to increase wear resistance. The company also made shoes for volleyball, wrestling, and climbing, among others. GTO and JELENK merged with Onitsuka Tiger to form Asics Corporation in 1977. Asics introduced the GEL technology in 1986. The company built this technology to lessen the chance of impact injuries. It has a silicon-based substance embedded into the EVA midsole to absorb shock and dissipate vibration. In 1987, Asics launched the Original GEL-Lyte. This ultra-light shoe was built to liberate the athlete's run. Later, the company started the GEL-Lyte II and III in 1989 and 1990 respectively. In 1991, another iteration of Asics Gel sneakers was introduced in the form of GEL-Saga which had an upgraded style to the sole and a lightweight synthetic upper. Soon the company developed the GEL-Lyte Ultra in 1992. It had new panels built across the upper and new outsole in to fill that gap, with a brand new outsole made to flex with the foot. In 1993, new variations of Asics Gel sneakers were released like the GEL-Lyte V and GEL-Kayano in the market. Long-distance runners loved the GEL-Lyte V because it had side panels for more breathability and new mesh inserts on the toe box. The GEL-Kayano was intended for the ultimate shock absorption and perfect for the high-mileage runners. Kayano's silhouette had a robust framework. It has porous P-GEL in the forefoot and Theta GEL for cushioning. Who owns the company that manufactures Asics Gel shoes? The company is owned by Asics Ltd. which is a Japanese multinational corporation that produces not only footwear but also sports equipment. What is the meaning of Asics? Among the Asics Gel sneakers, which is the most cushioned? The Asics Gel Kayano 25 features the Gel technology which is installed at the forefoot and the heel. It also utilizes the Fluidride midsole technology, ensuring your 26th mile is as comfortable as the first. What are the materials used in the Asics Gel lifestyle kicks? Depending on the colorways and models, Asics Gel sneakers usually utilize premium and durable materials such as synthetic, leather, suede and mesh for the upper. When it comes to the sole, Asics Gel sneakers commonly use EVA that provides a supple feel and flexibility and rubber that delivers optimum traction and support. What is the proper way of cleaning Asics Gel sneakers? Never put your shoes in the washer, instead separately wash the insoles by gently scrubbing it with an old toothbrush, soap, and water. Do not put them in a direct source of heat when drying as it will change the shape of the shoes. Instead, place and dry the shoes in a cool, dry and ventilated area for 24 hours. Among the Asics Gel shoes, which is best for an overpronator? Professionals recommend Asics Gel Kayano 25. Aside from the Gel technology, it is also equipped with technologies such as Dynamic DuoMax™ Support System, FlyteFoam, Impact Guidance System and Guidance Trusstic System™, giving more support in securing the foot in the right place through each running gait. Are Asics Gel casual kicks vegan? There are variations of Asics Gel sneakers that are made without any animal by-products. Released in 2015, Asics Vegan Pack features Asics Gel Lyte V with vibrant hues, on the other hand, the Asics Gel Lyte III and Asics GT II are in a monochrome tone. The uppers are a mixture of synthetic leather, suede, and breathable mesh. Are Asics Gel sneakers unisex? 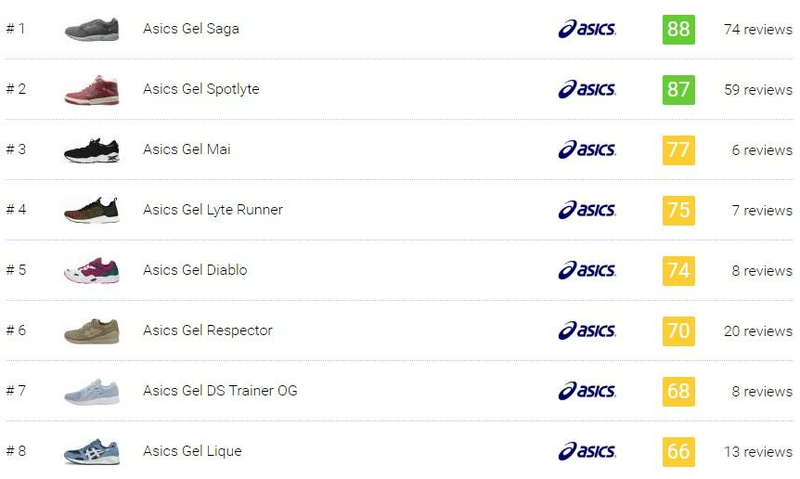 Most of the Asics Gel sneakers are unisex. 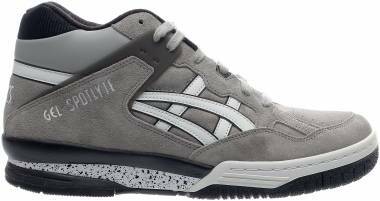 However, there are a few that are designed specifically for women such as the Asics Gel Lyte Komachi Strap, available in low and mid-top silhouette. 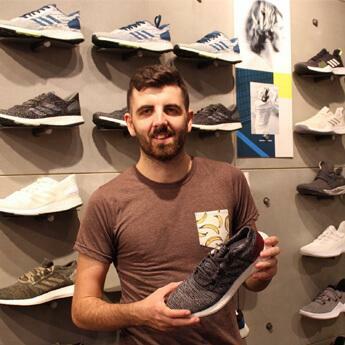 How do you style with Asics Gel shoes? Men and women can match their Asics Gel sneakers with a variety of casual and sporty outfits. These Asics Gel sneakers work well with jeans, joggers, and short pants. Women can also wear skinnies or skirts for a chic look with a sporty vibe.